MAYBE I LIKE FISHING for smallmouth bass them better than any freshwater species because it was the first fish I caught on a fly rod. It also might be that I prefer fly fishing in moving water or that smallmouths take surface and sub-surface flies and fight like hell. I enjoy catching all fish from bluegills to major saltwater trophies. But if I had one more day to spend in freshwater it would be floating a river for smallmouths. In saltwater I would rather chase bonefish than any other species. Smallmouths abound throughout the Unites States in cooler rivers but my favorite place to seek them is in Maine. Years ago it was hard to find a river there with a good smallmouth population where pollution particularly from pulp mills had fouled the waters making them unfit for fish or humans. That all changed with the Clear Streams Act of 1972 when Maine began actively restoring the rivers and removing dams. Today a host of these rivers now run pure and clean and smallmouths are back again. Fortunately, many Maine resident anglers revere the trout and ignore or look down on smallmouths. I have fished trout all over Europe, much of South America and such wonderful places like New Zealand (the best trout fishing) but for me a trout can’t hold a candle to smallmouth bass. 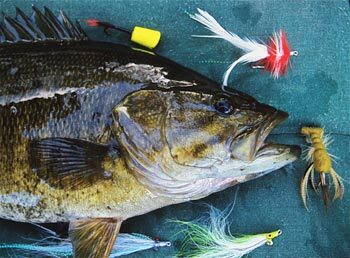 This disdain by Mainers for smallmouths has resulted in many fine smallmouth rivers being ignored. Maine is one of the largest U.S. states but has a population of only 1.3 millon people, with just one area code. The rivers are rich in insect hatches as well as minnows, hellgrammites, crayfish and other aquatic smallmouth foods. It is not unusual for fly fishermen to catch one or more four pounders on a trip and the average size of the bass is impressive. Frequently trout will take the same flies as the bass. Drifting these rivers fly fishermen see little evidence of civilization along the riverbanks and almost no one fishing. It’s easy to get the feeling of having it all to yourself. Once water temperatures rise above 60 degrees smallmouths begin hitting sub-surface flies but the real action starts when water temperatures near 70 degrees. Late May through mid-June are hot times for the pre and post spawn periods. All through July, August and early September can be good, often with popping bugs or other surface flies. Occasionally in mid-August the waters may get a little too warm during the middle of the day and action may slow. Fishing can really be excellent in September until the water temperatures drop to the mid-60s. Some choice rivers to fly fish are the Penobscot and the Sebasticook. The St. Croix in Washington County is a secret among local smallmouth chasers. 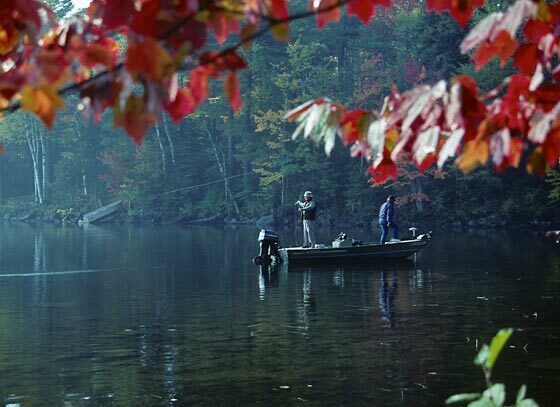 The Piscataquias River in the Howland produces great catches and feeds into the Penobscot. The big Androscogan in the Dixfield section can be fun to fish. If you enjoy wading small streams the Sandy River near Farmington produces some fine smallmouth fishing. The list of good fly-fishing rivers is long and the angler could spend years testing new waters. 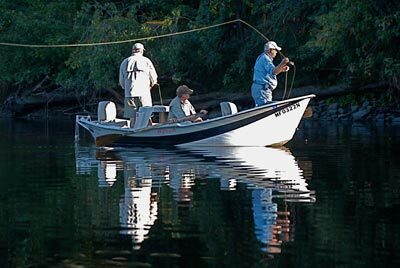 Modern Maine guides have top of the line drift boats and many are excellent fly fishermen and love seeking smallmouths. To name just a few: Mike Jones , Harpswell, ME, William Clunnie, Dixfield, ME, Scott Davis, Benton, ME and Bob Dionne, Farmington, ME.